Polycystic ovary syndrome (PCOS) is often entitled as hyperandrogenic anovulation. Individuals suffering from PCOS have minor fluid-filled cysts in ovaries. The cysts perplex with the regular functioning of ovaries, resulting in intolerable & fragile signs in women. According to the sources, between 1 in 10 & 1 in 20 women of childbearing age suffer from PCOS problems. This disease can even occur in girls as young as 11 years old. With proper PCOS treatment in Homeopathy, complications get reduced and disease even gets cured. Polycystic ovary syndrome (PCOS) is a dreadful endocrine system disorder in women during their reproductive age and it caused due to hormonal disorder. Women with PCOS can have enlarged ovaries that comprise small collections of fluid known as follicles — situated in each ovary. Prolonged or Irregular menstrual periods, acne,excess hair growth& obesity can all occur in women with polycystic ovary syndrome (PCOS). In teenagers, absent or infrequent menstruation may rise. These issues can be resolved by undergoing homeopathy treatment for PCOS. The exact cause of PCOS is unknown, but many of the experts consider genetics as a major factor. This disease runs in families, thus the probabilities of having it is more if there is a woman in your family who is suffering from PCOS and have irregular periods or diabetes. This disease can be passed down from either individual’s mother’s or father’s side. By taking PCOS treatment at right time the problems can be minimized. Hormonal imbalance is the main problem with PCOS. In PCOS suffers the more androgens are produced in ovaries than usual. This shows a major impact on development & release of eggs during ovulation. Presumably, insulin is connected to PCOS. In women, suffering from diabetes they take insulin to control the blood sugar levels in the body and the excess insulin in body produces more androgens which lead to PCOS problems such as Acne, weight gain, problems with ovulation and excessive hair growth. Homeopathy treatment for PCOS, helps in combating from all sort of PCOS problems. Extra hair on the body and Face. Frequently women get thicker & darker facial hair &additional hair on the belly, back and chest. Irregular or abnormal periods. Frequently women suffering from PCOS have not more thannine periods in a year. In some women there exists no periods, whereas others have very heavy bleeding. Metabolic syndrome: Metabolic syndrome augments the risk for diabetes & heart disease. Inflammation: Women with PCOS do suffer from long-term, low-level inflammation. 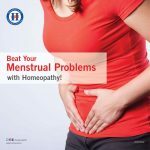 Homeopathy for PCOS problems is veracious choice as this treatment helps in battling with disease and lessens the complications. 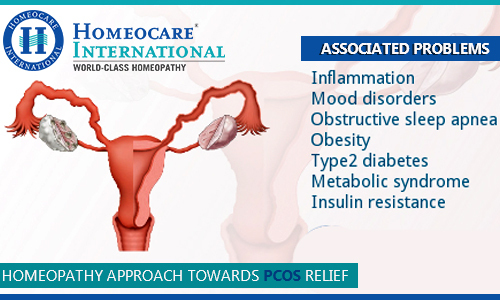 Homeopathy for PCOS, emphasis on root causes of the problem and not only ensures symptoms minimization but also cures PCOS& its complications. A genetic constitutional method is used in Homeopathic treatment, where individuals mental and physical conditions are considered and treated accordingly. Homeopathy for PCOS restores and balances individual’s immunity. Once the immunity is regained, it is able to nurse itself back to health without any external assistance. Thus, homeopathic medicines for PCOS are given, during PCOS treatment for better cure.